In this second section of our Outdoor Insects Month guide, you will be introduced to yellow jacket wasps. 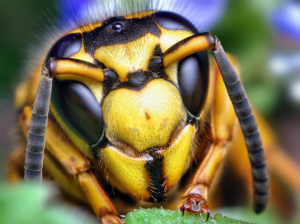 While many of the outdoor pests that exist are not dangerous to people and their pets, the yellow jacket wasp has the potential to be exceptionally dangerous. These insects possess a high level of aggression, especially when it comes to defending their nests. In fact, yellow jacket wasps and hornets are considered to be two of the most aggressive outdoor pests. Most that specialize in the study of or the pest control of these outdoor insects refer to yellow jackets as predatory wasps. In this guide, you will learn many important facts pertaining to yellow jacket wasps and some basic information on how to get rid of the yellow jacket wasp colony that may invade the areas in or around your home. Many individuals refer to the yellow jacket as a “bee”; however, these insects are wasps. They are distinguished from bees by the thin waist that they possess. When at rest, the wings of these insects fold lengthwise. As mentioned previously, these are predator wasps. In essence, that means that they prey on a wide assortment of arthropods and insects. This makes them highly beneficial. These creatures are attracted to certain types of foods consumed by humans. Examples include foods that are sweet, as well as a wide assortment of meats. Are Yellow Jacket Wasps Dangerous? Early in this guide, we outlined the fact that the yellow jacket wasp and the hornet are the two most aggressive outdoor insects when it comes to defending their nests. While the yellow jacket will not pursue people and animals without a purpose, when they do, they have the ability to leave behind a very painful sting. When a colony is present, the yellow jackets that are part of that colony will defend their space in an active manner. These colonies are typically only active for one summer season. Once the season has passed, the queen of the colony will move to another location in order to initiate a new colony. The wasps that are left behind will die and the nest that was left behind will remain inactive and unused. During the active period, if a colony is disturbed, the insects will become very aggressive and could sting. For most, the sting is only extremely painful; however, there are many that may suffer immensely as a result of an allergic reaction to the sting.